Note: This is not a review. This is our plain-English explanation and overview of the Tempur-LuxeAdapt mattress collection from Tempur-Pedic. 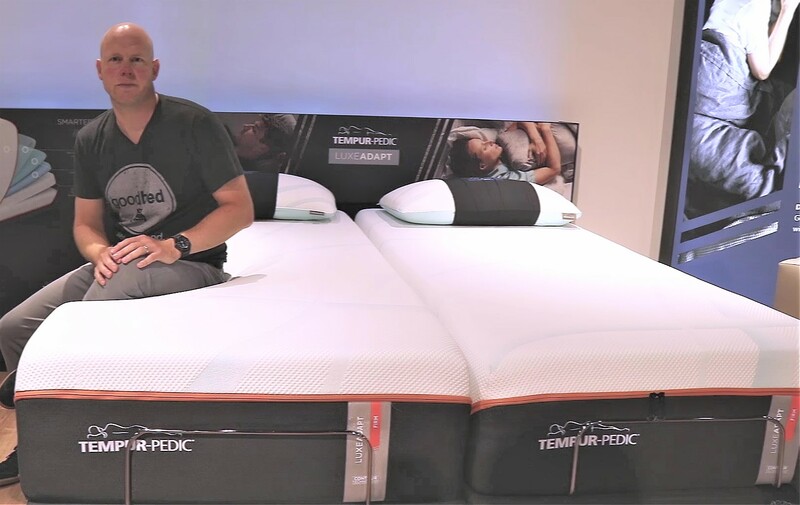 Also see our coverage of the less expensive Tempur-ProAdapt and Tempur-Adapt collections, along with our overview of the 2017 Tempur-Pedic mattress lineup, many of which are still available. If you’d prefer to watch rather than read, check out our Tempur-LuxeAdapt video. 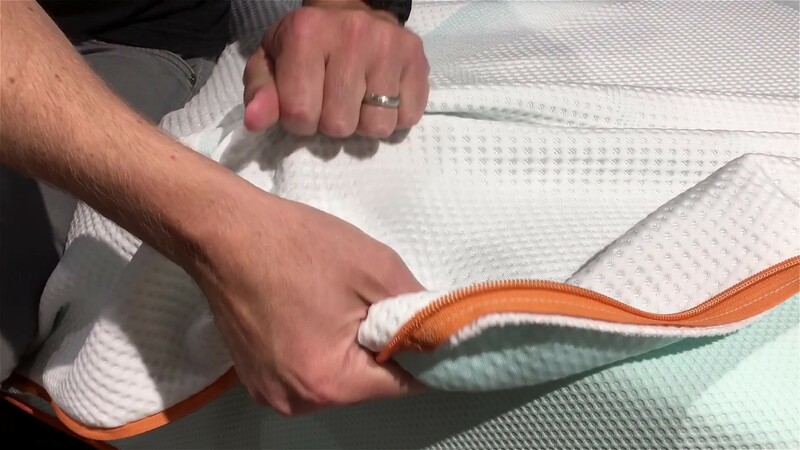 New for 2018, Tempur-pedic's Tempur-LuxeAdapt mattresses feature a new cooling cover that's removable and machine washable, along with a new memory material called Tempur-APR+ that the company says is meant to improve pressure relief. The 13" tall LuxeAdapt mattresses are sisters to the less expensive 12" Tempur-ProAdapt mattresses, which share the same removable and washable cooling cover, and have less of the Tempur-APR+ material. The even less expensive 11" Tempur-Adapt mattresses have the cooler cover, but it is not removable, and do not have the new Tempur-APR+ memory foam. There are two models in the Tempur-LuxeAdapt collection, a Soft and a Firm version. Both are available in Twin XL, Queen, King, and California King sizes. The use of cooling materials is a new-ish trend among mattresses. Typically, we see "phase change" materials included as a coating on a mattress's cover that makes it feel cool to the touch. Tempur-Pedic takes a different approach with the new covers on all of the Adapt mattresses. Woven into the fabric are special high-density fibers that by their very nature feel cool to the touch. (Think about how a high density material like marble feels cooler than low-density material like wood.). Since the fiber is woven in, it can't wash off or diminish over time. It's an innovative approach, and compared to Tempur-Pedic's previous mattress covers, it feels noticeably cool to the touch. The Tempur-LuxeAdapt and Tempur-ProAdapt lines both use the cooling cover, which zips off and can be machine washed. On the least expensive Tempur-Adapt beds the cover is non-removable. We pulled and tugged at the cover on the Tempur-LuxeAdapt mattresses and found it to be sturdy and well made. Tempur-Pedic, of course, is known for memory foam. The Tempur-LuxeAdapt mattress lines feature a new memory material, called Tempur-APR+, meant to stand for "advanced pressure relief." It's a a very dense, slow-responding memory foam, even slower responding than the company's Tempur-ES foam, also used in these models, as well as the other mattresses in the Adapt series. While we can't comment on specific pressure relieving qualities of the Tempur-APR foam, we did note some differences compared to the Tempur-Adapt, which doesn't contain the new foam. 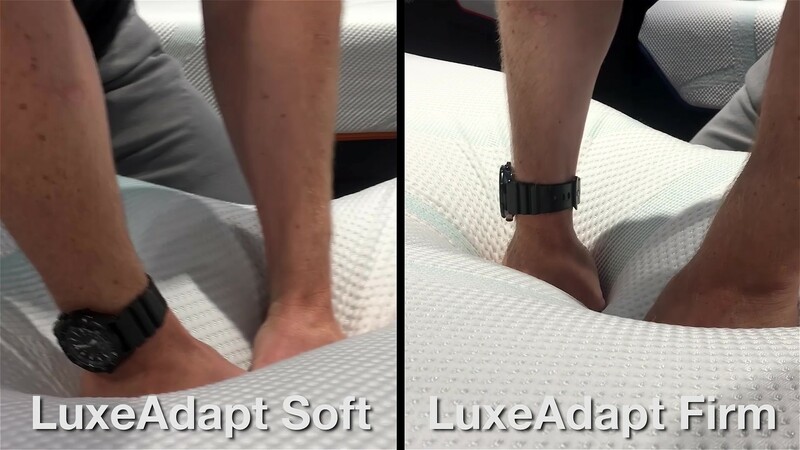 We found conformance to be greater on all of the ProAdapt and LuxeAdapt models, meaning that that the mattress adapts to the contours of your body very closely, especially as the foams warm to your body. At the same time, there's still firm support further down. 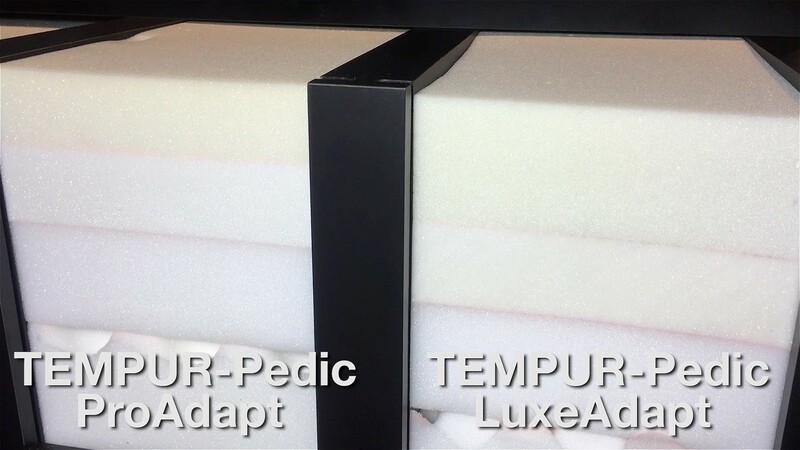 On the Soft version of the LuxeAdapt mattress, the new Tempur-APR+ foam is the top layer, with a layer of Tempur-ES foam next. On the Firm version, the order is reversed. Compared to the less expensive Tempur-ProAdapt mattresses, the LuxeAdapt has more premium memory foam, and is an additional 1" tall. 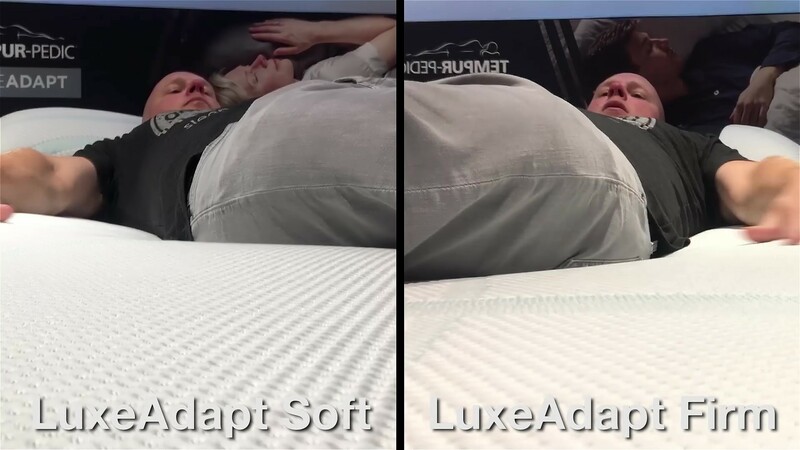 There are two mattress choices in the Tempur-LuxeAdapt line. Our own assessment of their softness varies slightly from what the company calls them. We would call the Firm version a Firm on our scale as well. Even so, there's still plenty of softness on top, and the same contouring and conformance to curves we noticed in all of the Tempur-ProAdapt and LuxeAdapt mattresses. We would call the LuxeAdapt Soft a Medium Soft on our scale. It has slightly deeper cushioning, as you can see below. And also here: Note the relative position of the side seam on our tester's trousers. Prices for both the Soft and Firm versions of the Tempur-LuxeAdapt mattresses are the same. Tempur-Pedic mattresses are available in many stores, whose delivery and return policies will vary. For orders placed online directly through Tempur-Pedic, free white-glove delivery is included, meaning movers will unpack and set up the mattress in the room of your choice, and removing any packaging materials. For orders placed online, Tempur-Pedic offers a 90-night trial period, with at least a 30 day required trial. Should you wish to return the mattress, a $175 return pickup and shipping fee will apply. One of the biggest, if not THE biggest complaints about any mattress from consumers regards body impressions—the inability of a mattress to spring back, eventually creating a low spot/sinkhole in the mattress. As such, mattress warranties all contain a term defining how big a sag or ‘body impression’ (measured when no one is on the mattress) is considered a defect, and thus covered under the warranty. The industry standard for foam mattresses is generally between ¾” and 1”. Tempur-Pedic has chosen to cover indentations that meet or exceed 3/4”. Practically speaking, that means any softening or sagging would need to be at least that deep before the warranty would offer you protection.